Another year has gone by and the time has come to plan your child’s next birthday party. Time flies by as you watch your child grow older, and it feels as though you just finished cleaning up from the last birthday party. But alas, here it is. The next year of their life starting and another party needs to be planned. You could go with the simple and boring birthday that you have planned year after year. You know the one — friends arrive and get sent back outside to play while you wait for the pizza to arrive, then some crafts are planned for the kiddos, followed by opening presents, and finished with a box-made confetti cake that the kids will take two bites of before running off to play again. Yes, that is a simple party to plan, and they are just kids, right? They don’t need some exquisite party to be planning or unique events to keep them entertained. 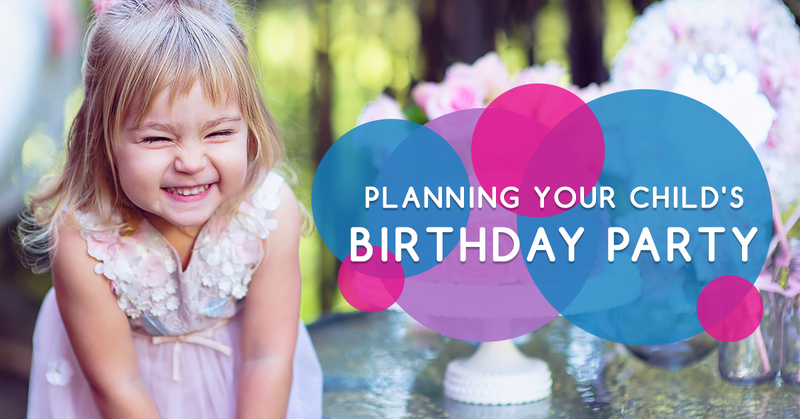 While that may be true, as your child gets older, they will be more and more aware that you have been planning the same birthday for them for the past five years. So, what are you supposed to do, go above and beyond and order a circus to come to your home and perform for them? That seems a little intense. There are so many different things you can do that are simple and can help make this birthday party more unique! At Jumpin’ Jamboree, we know a thing or two about fun parties! In this blog, we are going to talk about some unique birthday party ideas for kids! If you are in desperate need of a new and exciting birthday idea, read on! We will help give you more ideas. One easy way to turn your go-to party into a more exciting and unique birthday party is to plan different activities. There are so many fun things to do with the kids that can help make the party more exciting. While crafts and chasing each other around the yard is any child’s definition of a good time, try switching it us this year with some fun and different activities. 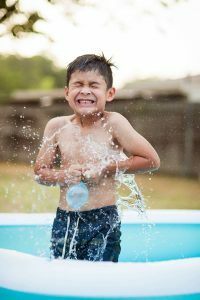 It can get hot in Florida, meaning that playing with water is a great way to boost the fun! If you have a pool in your backyard, plan some pool games that the kids will love. You will want to make sure all of the children know how to swim before planning these games. If some children don’t know how to swim or if you don’t have a pool, there are other ways to have fun with water. Buy a ton of water balloons and fill them up before the party starts have a water balloon fight in the yard with all of the children. You could also buy some of the small, dollar water guns that the children can play with. A Slip ‘N Slide is another fun way to add water to your birthday fun. Children love these slippery slides of fun and your birthday party will be a hit all thanks to this plastic mat! A scavenger hunt is another fun activity that your kiddo and their friends will love. Play a scavenger hunt across town. This activity will require a few extra adults to chaperone the kiddos, but hopefully, that isn’t a problem. Plan out different clues and places for the children to go and have them end at an ice cream shop or a playground, either could be a fun surprise for children. There are many fun activities that you could combine together to create a relay race. Put all of the children on different teams, creating two or three teams, and plan out a variety of fun activities, races, and other tasks that they have to complete to win. The winning team can get a prize of some sort. You will want to pick the teams because then, hopefully, feelings won’t be hurt. This will take a lot of planning and may take a lot of equipment, so start planning now if you think this is a good idea for your child’s party. The cake is a child’s favorite part of a birthday party. But what if you surprised them with a dessert that was more exciting and fun? 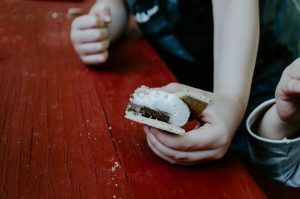 There are many different desserts that kids will love and that are so much more exciting than cake. Sundaes are a great cake substitute. Buy a giant tub of ice cream and a ton of different toppings and allow the children to create their own sundaes. Have a ton of different sprinkles ready. Crush up for Oreos to add as a delicious topping. Get some hot fudge, caramel, or the chocolate topping that hardens into a shell. The more toppings the better. Oh, you may also want to do sundaes outside, otherwise, you will have sticky ice cream fingerprints all over the walls, furniture, and basically everywhere else. Smores are another fun and unique birthday party dessert. These ooey-gooey, chocolaty treats are fun to make and fun to eat and all of the children will love them. If you want to go all out, get a fire pit to add to your backyard that the children can roast their marshmallows at. You may want to check with parents to make sure they are okay with their kids being around fire, and be sure to keep a close eye on the children while they roast their marshmallows. If you were reading through all of our ideas above and thinking about how much preparation work they all take, then we have a new idea for you. Give up the same old pizza party and confetti cake and plan something completely different. A unique party is a great way to add some excitement and fun to your child’s birthday party. So, how are you supposed to plan a completely different and unique birthday party for your kiddo? That is where we come in. At Jumpin’ Jamboree, we can help you plan a birthday party that is completely different than any party you have ever thrown for your child. With two locations in Kendall and Doral, you can find a Jumpin’ Jamboree that is closest to you. This is a fun and exciting place to bring kids. Plus, our birthday party packages can make this birthday extra special for you kiddo! Our indoor inflatable playgrounds can keep the children entertained all day, bouncing and sliding for hours on end. 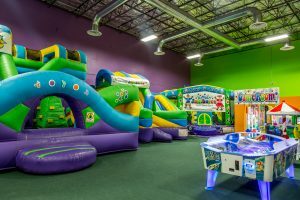 Learn more about our birthday parties, what we offer, and how stress-free this party can be for you and start planning your child’s next birthday at Jumpin’ Jamboree today! We make parties easy and fun! Contact us to learn more and to reserve your party space. We look forward to helping you plan a new and exciting birthday party for your little kiddo!